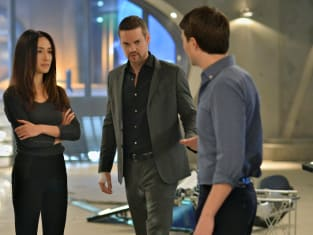 Ryan woke up from his coma to an entirely differently reality on Nikita. In "Self Destruct," Alex set out to complete her mission of saving people in response to Sean's death. Meanwhile, at Division, Ryan came up with a plan to protect everyone, while sacrificing himself and destroying the institution. Even though, they always planned on shutting down Division, this definitely was not an ideal situation for them to be in. Alex's journey post-South Ossetia has been tragic. Amanda really messed up Alex's mind and was responsible for the devastation at Division and ultimately Sean's death. Even though he tried to get through to Alex with his dying words, Alex was still under her Larissa-induced mind frame. With nothing left at Division for her, she took off and tried to save more people. She was risking her life and everything to make a difference and fulfill the destiny that Amanda gave her. It only made sense that it would be Nikita that would bring the old Alex back. Even through their fights and differences, they have a bond unlike any other. Alex trusted Nikita enough to see through to the truth. Despite Amanda's role in Alex's actions, it will take time for Alex to come to terms with what she was manipulated into doing. She made a strong start by agreeing to return to Division even though it meant facing Ryan again. 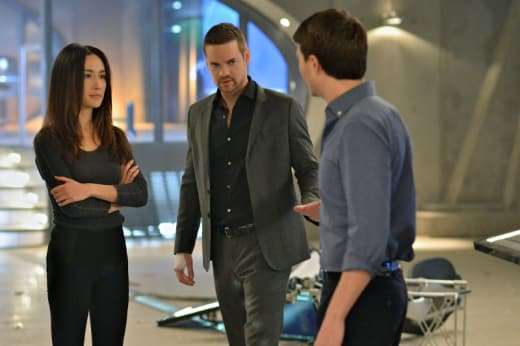 His hesitation to trust her was understandable, but as Nikita said they needed all of them to succeed. Ryan's decision to destroy Division and take the fall was noble, but unnecessary. It's something that Nikita would never allow her friend to do, as long as, there was any other option available. Ryan finally realized how close he came to falling into the Division trap. He grew to like the power of the institution and his role, but he didn't cross the line in any way that justified the sacrifice he was willing to make. Nikita made a good point that their small group took out Percy without Division resources, while actually having to defeat them. Amanda doesn't have nearly the backing of Division and not even the decimated Division. They should be able to use the Black Box to track and destroy her. It will be sad to see the evil one taken out, but it's necessary for their protection and the security of the country. The idea of the New Division was a good one, but it was built upon taken lives. Some of the ex-Division agents will certainly acclimate themselves back into the real world without problems, but others are bad people who will definitely go rogue. It's unfortunate, but true and they will need to be handled by someone. Even though the New Division was a bust, Team Nikita remains strong. Perhaps a small knit group of black operatives is better suited to bringing in the Dirty Thirty and any other new rogue agents. Though, it's still unclear what, if anything, Amanda planted into Nikita's mind. Was Nikita's reflection on her suicide mission quest after Daniel's death prompted by something Amanda did to her? Or, just memories brought to the forefront by Alex's actions. Either way, it's sure to be a wild ride to the end of Nikita season 3. They not only have to protect the secret of Division's implosion, but track down Amanda, Owen and the black box.